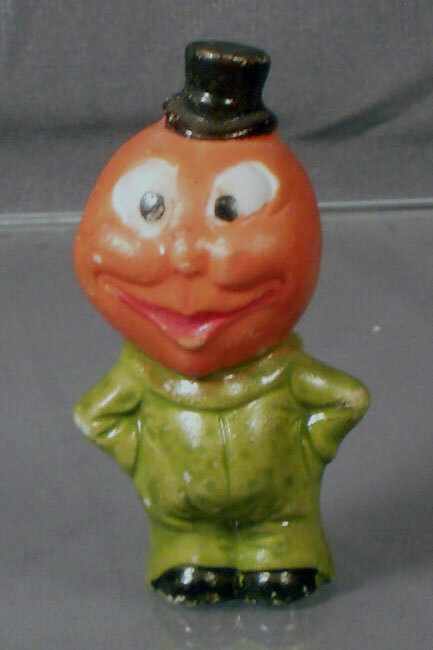 Once you start collecting vintage Halloween items, you notice how frequently fruit and vegetable-headed figures show up. Here’s a good example of a small, incidental bisque figurine that was probably produced in the 1930’s and sold for a nickel or a dime. It might have been a party favor or just a little knick-knack, but there’s certainly nothing scary about him. He’s about three inches tall and is marked “Japan” on his back. And if his jaunty little top hat, crossed eyes, and big grin don’t put a smile on your face, nothing will. This entry was posted in 1930's, Carol, Halloween, Holiday, Humor, Toys, Weird. Bookmark the permalink.